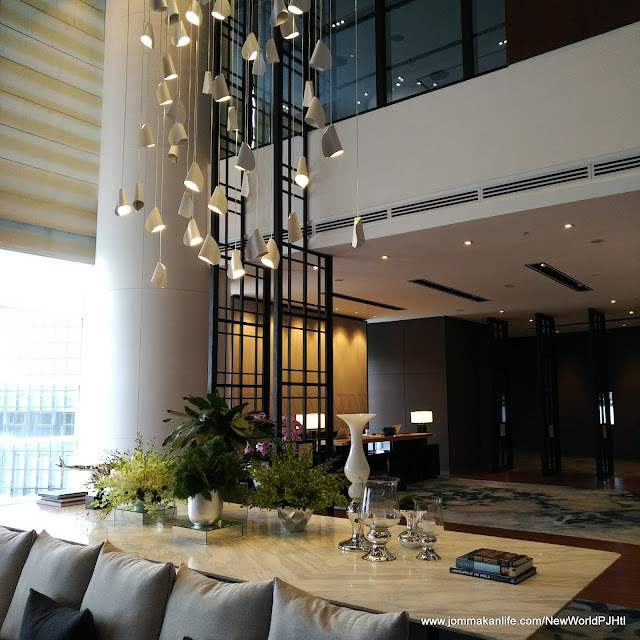 A weekend staycation encsconced in one of the tallest hotels in Petaling Jaya sounds like music to our ears. Thanks to New World Petaling Jaya Hotel, we checked in for a first-hand experience of the suite life recently. As expected, we breezed through the check-in on arrival. Located beside the bustling Paradigm Mall and with close proximity to the Kelana Jaya LRT station, hotel guests will find easy, convenient connection to business and leisure activities from the hotel. By day, the expansive lobby is airy and light-filled, accentuated by a soaring high ceiling and a contemporary light installation reminiscent of raindrops as its focal point. Evocative of a chic living area, the Lounge furnished with numerous comfy couches, wing chairs and modern chaise lounges beckon invitingly. Coupled with tasteful Malaysian decorative influences such as a six-metre high wau (traditional Malaysian kite), a giant gasing (wooden spinning top) sculptures and local artworks, this welcoming space offers plenty of Instaworthy possibilities. 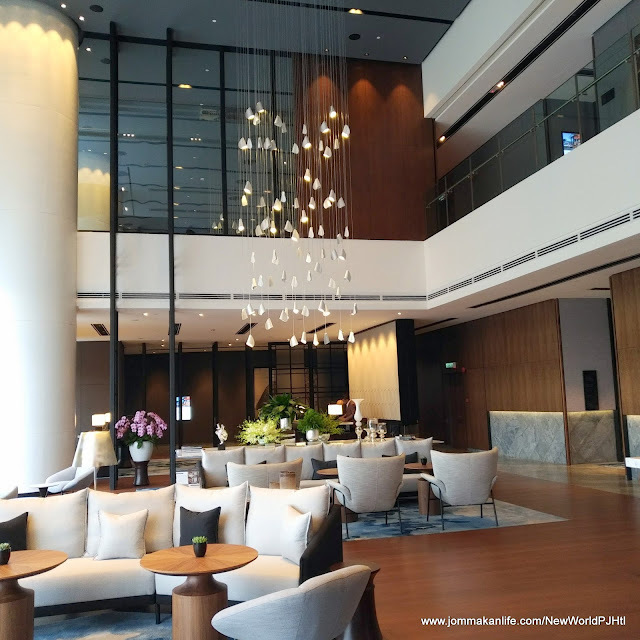 General Manager, Jai Kishan said New World Petaling Jaya Hotel is a gateway and a home for business and leisure travellers; convey through its 300 plush guest rooms featuring bamboo flooring, sleek furnishings and marble-clad bathrooms. We were stoked to find ourselves revelling in the lap of luxury once we entered one of the 20 spacious suites. Modelled like an upmarket apartment, the linear and tactile layout in neutral shades of chalk, sand, stone and wood is easy on the eye. Pops of colour from Malaysian-themed artworks and key furniture pieces like the high-back swivel reading chair complemented by the warm glow of mood lighting at strategic nooks and corners evoke homely vibes, making us feel instantly welcome and at ease. A free-standing bathtub takes centrestage inside the spacious bathroom in addition to a separate shower and toilet. Fluffy towels, bathrobes and luxe amenities are par for the course here. Our fave has to be the powerful rainshower which offers a constant flow of temperature-controlled hot/cold water. Alternatively, frolicking in a bubble bath whilst admiring the panoramic PJ city view is a great way to while time away. In these connected times, complimentary WiFi access is fast becoming a key necessity and New World PJ Hotel is well-equipped in this aspect. Our suite boasts mod-cons like electrical plugs with USB slots, a Nespresso machine, wall-mounted flatscreen TVs and a sleek work desk that score extra brownie points with moi. Our suite experience starts from RM778 nett per room per night. Perks include buffet breakfast for two adults at Pasar Baru, and exclusive access to the New World Hotels’ signature Residence Club Living Room where evening cocktails is served from 6pm to 8pm, refreshments throughout the day and dedicated concierge service. Mirroring the same sleek look, the Residence Club Living Room offers abundant private space for small groups to converge and chat. Depending on your preferred seating of choice, certain areas are furnished with sectional sofas with cushy armchairs and low coffee tables whilst others have dedicated dining tables and high stools. Panoramic vistas of the city skyline are visible from different vantage points. 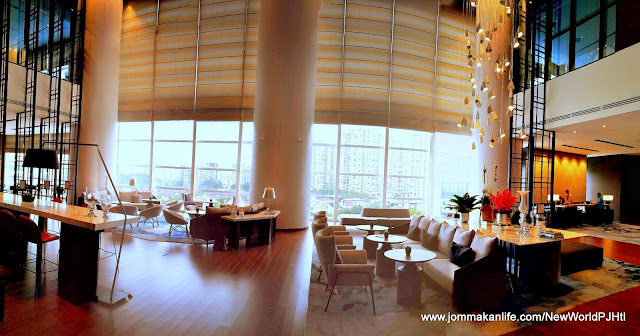 Located on Level 29, the Residence Club Living Room is open from 7am to 10pm. There's a boardroom here for meetings (complimentary 2-hour use for suite guests), with onsite administrative services upon request. An island tableaux in the kitchen nook serves the chef’s selection of nibbles during evening cocktail hours from 6pm to 8pm. Wine, beer, juices and soft drinks are available to liven up the convivial atmosphere as a fine precursor before dinner. You can tell we had a field day and night feasting on the wide array of goodies at Pasar Baru. Nothing beats waking up to a splendid cooked breakfast of eggs cooked to our liking, accompanied by sausages, grilled tomato and fried mushroom. Of course, we simply could not pass up on the house speciality of curry laksa. Trad Indian fare: thosai, roti telur and vadai proved on-point as well. Come dinner time, the spread was no less extravagant. The hearty Indian selection proved irresistible but notable dishes that scored highly with us also included the deep-fried durian fritters, chicken rice and soupy noodles. Up on Level 30 is the PJ’s Bar& Grill where the rooftop restaurant and bar extends out to a viewing deck with uninterrupted view of PJ's panoramic skyline. Western and Asian grilled dishes, tempting appetisers and creative cocktails are the key culinary attractions in addition to a private cigar lounge. Water babies will find the outdoor infinity-edge rooftop pool up to splashing expectations. Besides the whirlpool proffering soothing water therapy, a kiddies' wading pool is found around the corner from the vertical garden feature wall. Gym bunnies can have the run of a fully equipped state-of-the-art fitness centre illuminated by natural light on Level 29. For more information on New World Petaling Jaya Hotel or to experience a similar staycation, please visit newworldhotels.com or call tel: +6 03 7682 0111. Waking up to that roof top pool view would be great! TOP 10 EATS OF MALAYSIA BOLEH!